Treasured Pictures! | To Be, To Be. Tutubi. 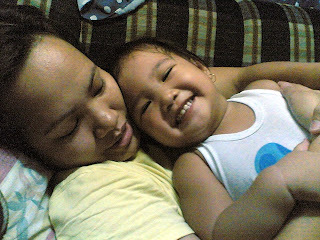 The theme for this Friday's Mommy Moments is Treasured Pictures. I have a lot of them so it was difficult to choose but here are just two of them anyway. My little girl just loves to cuddle and it makes her happy to have any part of my body touch hers. Even when its not her turn to sleep beside me, she makes sure that she can make "dantay," even if it means I have to sleep sideways! This picture was taken when I was sick, but she insists on cuddling anyway. 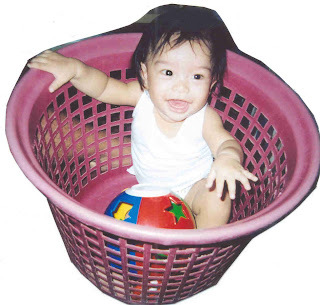 This next picture was taken when Danniel was not even a year old. I was doing the laundry and my mother placed him in the laundry basket. It was good luck that we still have film on our camera and I was happy to have taken a shot. These are just some of my most treasured photos. Of course, a lot of them are in albums when we used to have the photos printed from our camera films. What a cutie shot with mommy and baby...happy MM! i love the second photo, i grew up playing in one just like that. my kids want to play with that too. i love the first shot! definitely a treasure!